The wind in my hair, the sun on my face, the speed of the boat and the view on the Perhentian islands. This is my favourite holiday feeling. 8 Years ago we went to Pulau Perhentian Besar for the very first time. We selected the island because we couldn't find much information about it at that time, meaning it is not the most touristic place. And we were right. Now we come back to this special place every year to relax and enjoy nature at it�s best. The islands getting a bit more developed, but in the meantime we found our favourite place to stay in paradise: Shari-La Dive Centre and Resort. After a half day trip from KL via plane, car and boat we arrive around 1.30 hrs at the island. Our private beach Tanjung Tukas. The waters are so clear that we can see the housereef. The staff of Shari-La is waiting for us on the beach. They help with our bags and welcome us. It feels like coming home. Shari-La Resort and Dive Centre is very laid back and has it�s private beach. This part of the island can only be reached by boat, so there won�t be other guests at this beach, meaning it is now �our� private beach. The A-frame bungalow which we always have is basic but all what we need for these 11 days. They even have hot water. Before that time we always tried to be at the shower first after diving and a day at the beach because the first shower of the day had warm water as its was warmed up by the sun in the pipelines. The one who went second had a less nice shower, brrr. Our typical day at Shari-La starts with a relaxing breakfast. Then to the dive shop to prepare our dive gear. What I like from Shari-La is that we setup our own gear, it helps us in getting familiar with it. After a nice and detailed briefing we head to the boat. Although Shari-La is located on a isolated part of the islands they always go to the best dive sites, even though it�s the furthest away. They want their guests diving at the best dive sites. 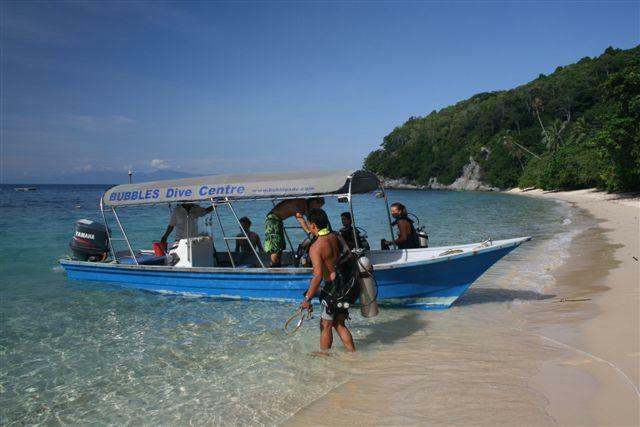 This is completely different from what other Dive Centres at Perhentian do. Other Dive Centres look at the number of divers, are there only 2 or 4 divers, then to bad, you will go to a dive site nearby. With Shari-La we always go the best dive sites, and if you like you can even tell them where you want to go and they will try to fit that in. Diving with the Shari-La staff, Ronnie, Peisee and Eric is really great. They know so much about the marine life, about diving and about nature in general. They know about every fish and coral that can be seen around the Perhentians and they are always happy to explain and tell about it. And also important, they are very professional. We both always feel very comfortable and safe diving with them. The dive gear is always clean and nothing broken, old or missing. Not to mention the dive shop itself. 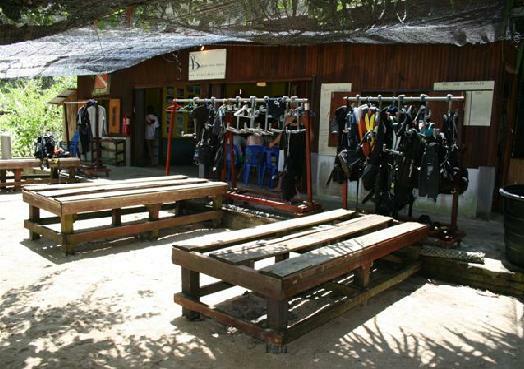 It has a unique setup which I have never seen before at other Dive Centres, totally designed for divers routine and comfort. After the dive we always take some time to fill in our logs. The Shari-La staff is always helping to identify the fish and corals which we have seen. There is something to drink and to snack. Then it�s beach time. Relaxing, snorkelling and having lunch. In the afternoon we go for a second dive with same routine; setting up gear, briefing, diving, log, and then back to the beach. This is the daily life at Shari-La at Perhentian. Around 18.00 hrs we go for refreshment taking a shower. After that it�s dinner time. The restaurant improved so much since the first year. The food is tasty and fresh, and of course the Asian dishes are best. It may happen that they don�t have a certain vegetable, but then they will find something else which is delicious too. That can happen when living on an island where everything has to come from the mainland. After a delicious dinner we relax further, maybe play a game or read a book, and then it�s bedtime. 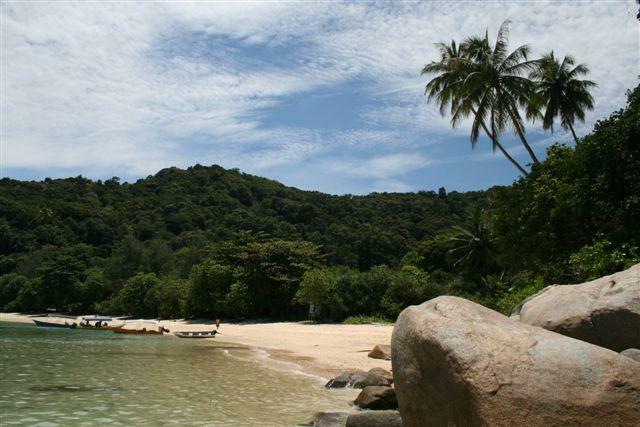 The dive sites at Perhentian are very nice and can be quite different as well. There is even a wreck dive. My favourite dive site is Tokong Laut meaning Temple of the Sea. The name says it all. It�s beautiful. But also Tiger Rock which is just around the corner is one of the best dive sites of the islands. And then the dive site found by Shari-La last year, the Tufclub. It�s a sandy bottom, but there are the strangest marine life to find, and.... seahorses! 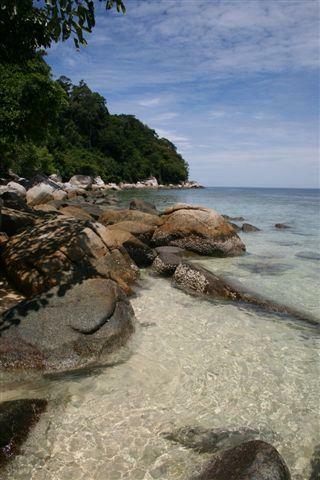 Also snorkelling is very nice at the Perhentians. Shari-La has a fantastic housereef. Really one step in the sea and there it is. Near the housereef we work on a conservation project named PIBAR. We are 2 of the founders of PIBAR, the artificial reef. PIBAR stands for Perhentian Island Shari-La Artificial Reef, but it also stands for the first letter of the names of the founders: Peisee, Ilse (that�s me! ), Brian (my boyfriend! ), Alan and Ronnie. We created PIBAR using loss rocks and loss dead coral which we found on the sand bottom after a storm. We placed it together and already in the first half hour life began to develop. Little fishes came to see and find a hole as home. Now after some years it�s a small reef, developed with more life and even anemones with the resident anemone fish (Nemo). Every year when we come back PIBAR is bigger with more life. This is not the only conservation project. The beach is not only for us, it is especially for the turtles who come and lay their eggs. When this happens at night the staff will wake you up (if you like) so you can experience this. I love the turtles. They have a hard time crawling up the beach, looking for a good spot, dig a deep hole to lay the eggs, close it and cover it up, and then crawling back. This can take hours, but it�s so peacefull to sit there on the beach, in the moonlight with sounds of the sea, watching this nature experience. We also experienced the hatching, it is really so cute to see these tiny turtles crawling to the sea. And then we hope they make it through the housereef without being catched by natural predators. There is a volunteer program on turtles and nature reserve at Shari-La. This shows how much they care and love nature and our earth. As you can see in this story, we fell in love with Perhentian and Shari-La. We should not tell about this special place to everybody, because it will get more busy. But the Shari-La friends are really so nice and they deserve to have a good business. So if you want to relax on a private beach and snorkel and dive in pristine waters then Shari-La is the place to be. 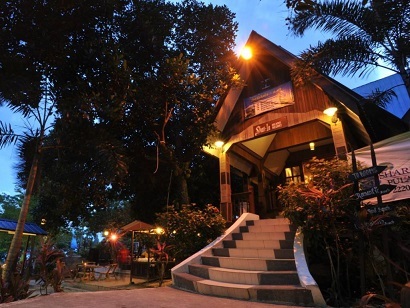 Shari-la Island Resort is ideally situated on Pulau Perhentian Kecil; one of the islands most popular locations. From here, guests can enjoy easy access to all that the lively island has to offer.